This week has been a little light on the blog post for Erzullie. We can't deny that we have been a little quiet on the social pages which is surprisingly new for our brand as you know we love to chat up a storm. 1. The Fierce and Flaunt Plus Size shopping event, which we are very excited about as we are partnering with Shop Chubbly! Another amazing plus size brand in Metro Manila. If this event becomes successful, we hope to include other plus size brands as well that we know you girls will definitely love. 2. We are preparing for the Pre-Holiday and Holiday 2013 collections already. We will be honest, a lot of internal changes have been happening in Erzullie and well, some adjustments have to be made. Our head seamstress, Tita Glen, died this month and it really took a huge blow on us personally and business wise. She is a great part of the Erzullie family and well... I think you already know what we are feeling right now. But there are other things greater than grief. We know that if Tita Glen was here right now, she wouldn't want us to give up. She knows that we do this for the local plus size community and we will continue on to honor her belief in us. Again, Tita Glen, wherever you are, rest in peace. We will continue your legacy of amazing skills in tailoring. Super hugs. In addition to that, we know how much Erzulliestas love how we put so much thought in the value of each of our design. As such, for the Pre-Holiday and Holiday 2013 collections, we are now switching to Demi-Couture. What is demi-couture? Well technically there is a lot of definitions of it and it has not been pinned down. But so far, it is the combination of RTW and couture. RTW is mass produced while couture is defined as "custom made either by hand or machine". In application to Erzullie, we will only 8 pieces in total for each design that we will make by hand or machine to protect and create higher value for each design. Will that mean higher prices? Of course not. We will keep all the prices as they are right now, it's just that the number of it will go down. So that every Erzulliesta would know that anything bought from Erzullie is of high design and aesthetic value. Only 8 people in the world can have it and one of them belongs in your closet. 3. Next month is the start of the much awaited, PLUS SIZE MODEL GO SEE. We will be posting it in all of our social sites after the Fierce and Flaunt event so interested applicants, be alert about it. I personally suggest that you brush up on your Erzullie because what we are looking for ultimately is THE NEXT ERZULLIE ICON. 4. Oh! Check out the latest list of our outlets! Due to the business direction we are about to take, as we have mentioned earlier, we are going demi-couture, we have decided to streamline our outlets. We are still available at Backstage Store, 2nd Floor, Serendra, Taguig City. And on with the recap of the Erzullie week! #1 The Fierce + Flaunt Plus Size Fashion event is on! We are very happy to announce that we are partnering with Shop Chubbly for a pure plus size shopping event. 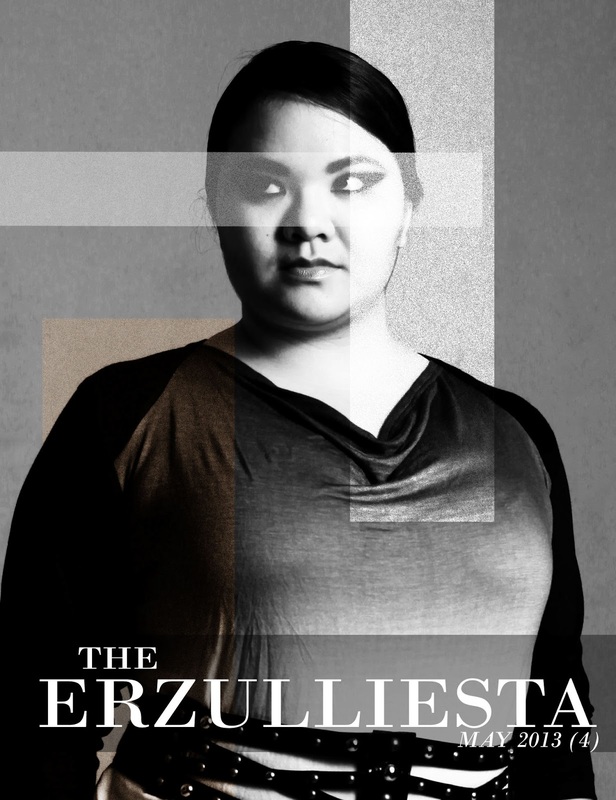 #2 Erzullie Icon and Plus Size Model, Loren Monares, looks like a goddess in this Erzullie Couture creation by Bernalyn Cuevas. Loving it! #3 Speaking of couture, of course, Erzulliestas would definitely agree to this week's Mantra: "My curves design the best kind of clothes!" #5 The Erzulliesta May 2013 (3) came in late this week, but nonetheless it is packed with all of the Erzullie plus size goodness! Read about the past week and get updated!